Good Morning, Welcome back to my blog! A little bit frosty outside the last couple days, a bit of white on the ground. The days are getting cooler and a bit shorter, a sure sign that winter is approaching hopefully not for a few more months. 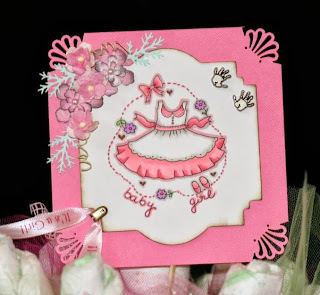 For this post on my blog I made a GREAT baby gift for my niece and added a fabulous tag I made from Whimsy Stamps made by designer Lia Stampz. The tag is called Baby Girl and there is also one for a baby boy they are super cute, cute, cute. 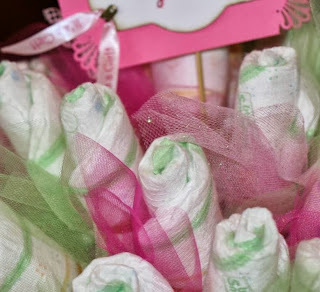 This gift is made using newborn diapers rolled into little roses and put into a bouquet in a vase filled with wonderful little baby things like a book, lotion, washcloths, spoons, baby shampoo and a lot more. I was surprised how much stuff I could actually get in this vase. 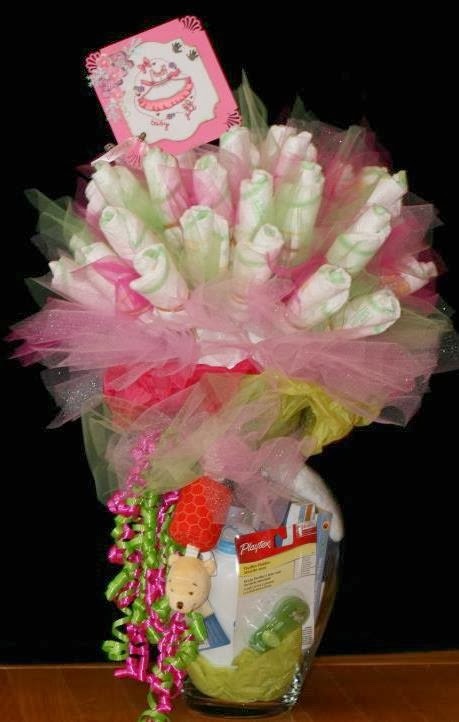 My niece loved it, it looks like a bouquet of roses but everything is usable, and I love that part of this gift. A closer look at the tag that I colored and put in the bouquet. Supplies: Copic markers, Martha Stewart corner punch and branch punch, Memory box flower dies, Distress ink, miscellaneous ribbon and metal embellishments.